The compassionate best and bickering worst of our city’s councillors were on full display at their monthly get together at City Hall last week. The first two and a half hours of Thursday evening’s Dome gathering was littered with familiar squabbles over sporting pitch provision, burial fees and bi-lingual street signs. But for the final half hour the politicians put their differences aside and spoke in a united voice about a member of the Council’s Youth Forum who was buried that morning after dying tragically a month earlier. North Belfast man Joby Murphy, who died when he fell into to the River Lagan after a night out drinking cheap shots in January, was a member of the Council’s Youth Forum. The Council unanimously carried a motion urging an end to cheap drinks promotions and a review of the safety provision on the banks of the Lagan. 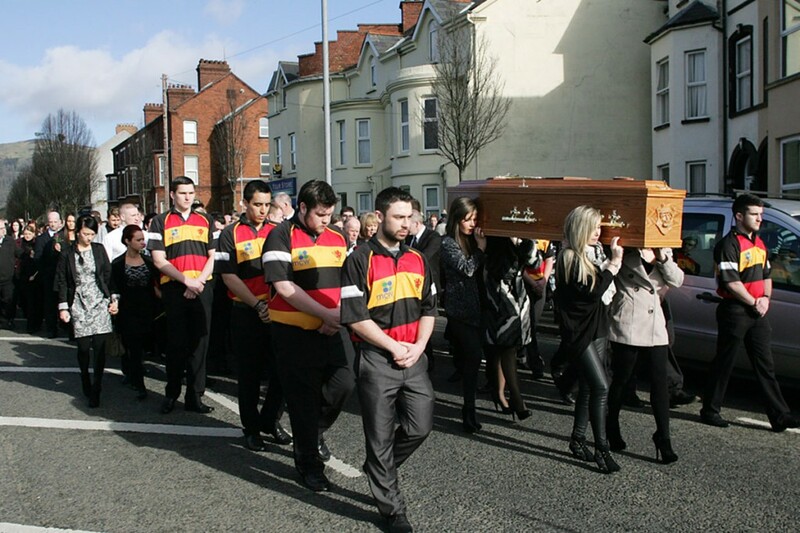 Oldpark Sinn Féin councillor Conor Maskey, who proposed the motion, said it was poignant that it came before Council on the day Joby was laid to rest. Alliance’s Tom Ekin, Ulster Unionist David Browne, the SDLP’s Pat Convery, the PUP’s John Kyle and DUP man Christopher Stalford all echoed the calls for cheap drink promos to be addressed by the Council. They also spoke in glowing terms about Joby, who won a Special Achievement Award in 2008 for representing young people in the Youth Forum. He received that award from Sinn Féin Councillor Tierna Cunningham, who paid a heartfelt tribute to a “true champion of young people” on Thursday. “Joby Murphy was an inspiration to us all, it was a privilege to know him,” she said in a fitting end to the meeting. Elsewhere Councillor David Browne revealed that he had recently donated £4 to a collection for an Irish language group in the Park Centre. But he still rejected a Sinn Féin motion on how bi-lingual street signs are selected by Council, whether Irish or Ulster Scots, because they were “a luxury we can’t afford”. Sinn Féin wanted dual-language street signs where a majority of residents who respond to a survey consent to have them. Currently non-replies to street sign surveys are counted as no votes. DUP man Brian Kingston said he it had to be clear that a “consenting majority” wanted dual signs before Sinn Féin’s Tom Hartley reminded him that an area he represents, Shankill, is an Irish word that he lives with everyday and it “doesn’t bother” him. Another contentious issue – the Council’s playing pitches strategy – raised its head again. The DUP wanted the strategy, which looks at sporting pitch provision across the city, referred to the Council’s legal team after an Equality Assessment Impact Assessment found that certain groups, including Protestants and ethnic minorities, may have less opportunity to benefit. Councillor Gavin Robinson denied that his party’s call was simply because the strategy meant money would be going to the GAA, but Sinn Féin councillor Jim McVeigh said the strategy presented an opportunity to “redress the historical imbalance” of discrimination against the GAA. The SDLP’s Nichola Mallon said the council “need to get on with” implementing the strategy and the DUP motion was rejected.